Amb. Deividas Matulionis became Ambassador of Lithuania to Germany in 2012. On the 31th of March we visited the embassy to get a better view on what their work looks like. Lithuania won independence in 1990, and since than they have become a member of the United Nations, the European Union, the EUROZONE and the NATO. 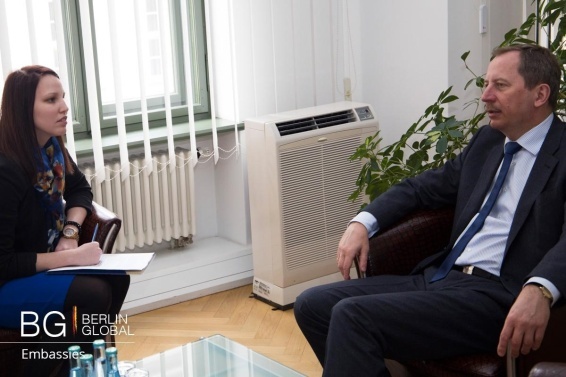 In this interview we talked about the embassy's daily life, Lithuania’s economic position and the threat among Baltic nations caused by the crisis in Ukraine. You have had a very successful career. You have been government advisor for international relations, the Ambassador of Lithuania to Denmark among others and now, since 2012, the Ambassador of Lithuania to Germany. From these different but influential positions, which have you found to be the most challenging? All positions were challenging, but definitely the Ambassador in Germany is one of the most important positions because of the weight and importance of Germany. Besides that, I was working on the field of politics, I was working as the chief of the staff of the Prime Minister before coming here and that was also a challenging job related more to the domestic policy. Therefore, I have experience in both domestic and also in foreign policy that is very important to have this knowledge. In the Forbes magazine’s list about the most business-friendly countries, Lithuania is ranked 17th. It managed to improve by 7 positions within one year. In your opinion what is the key to Lithuania’s success? Since our independence, we have very clearly stated that we need to integrate ourselves into the European investment structures. We are still in the process of catching up in relation to most of other EU countries. But there is a will within the political parties to make a reform process including the modernization of the country, the society and the business conditions. We are making success, of course it is not as big as we expected 25 years ago, when we established our independence. We thought that development will come faster, but this is normal. Since the crisis, the government has tried to make efforts to make it easier for business to open, so now it is really fast and does not require many documents or bureaucracy. Yes, we are one of the world leaders when we speak about the efficiency of opening a company. Most of the functions are implemented online and to establish a company takes no more than three days. Nowadays Lithuania is dedicated to become a knowledge-based economy. Do you think this is the future? I think one of the prerequisites for the further modernization of the country is also our knowledge economy and in the past 10-15 years we have invested a lot into internet connectivity and at the moment we are in the top three countries on the world concerning the high speed internet, and we are number one in the European Union. This attracts also IT companies and startups to Lithuania. This is very good development. 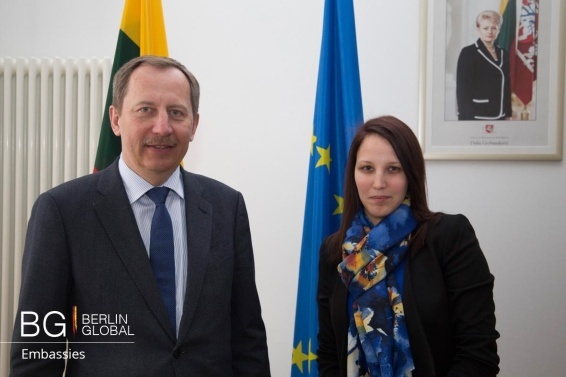 How have relations between Lithuania and Germany changed over the years and in what ways is the Lithuanian Embassy in Berlin promoting Lithuanian culture? With Germany we have always been very closely interrelated, because of our, in a way common history. We had many cultural contacts and the German language was more popular in prewar period than English or French. At the moment Germany is a very important partner in the European Union in political and security matters, we can count on German assistance when it comes to our security. We had positive development in the past years. Also Germany is one of our major trading partners besides Latvia and Poland after the so-called Russian centrists were in post. Russia used to be the major trading partner but that is no longer the case. You spoke about the German language in Lithuania, but what is the situation with the Lithuanian language in Germany? Now it is possible to study Baltic languages in some German universities and at the moment there is a possibility to study it in Humboldt University as well. It used to be the case that many German linguistics were interested in Baltic languages in the 19th century, for example one of the Humboldt brothers had researched in Baltic languages, also brothers Grimm, and they found Baltic languages as the oldest of European languages. You just celebrated the anniversary of the Lithuanian community in Germany. The former Lithuanian community was established here in Germany in 1946, because after the Second World War eighty thousand Lithuanians found themselves refugees here after the Russians came in and that was the period when our community was established. I see you are very vocal about the recent conflict between Ukraine and Russia on Twitter, do you think this conflict has affected your responsibilities as an Ambassador? This conflict has affected not only my responsibilities but the responsibilities of all ambassadors. This is an unprecedented conflict, and since the Second World War you cannot find any similar case when a neighboring country occupies part of another country and annexes it. That is why we are very vocal and very critical, and we will continue this, because this is a very dangerous development. What do you think about the role of the NATO in this conflict? NATO is doing a good job and it is strengthening the security of the Eastern European NATO members. We expect that in July we will stabilize the final decision to bring more troops into these countries, including the Baltic States and Poland. NATO should show that all NATO members are equal and they will be defended if someone challenges them. Of course the Ukraine is not a NATO member, but we need to establish closer contacts with them, because it is a country, which is interested in having closer cooperation with NATO and the European Union. Do you think that Ukraine should be Member of the NATO and the European Union? I think we should say clearly that if Ukraine, as a European country fulfills the EU requirements, than we cannot say that it is not entitled to become a member state. Therefore, we are very vocal on the issue that Ukraine should be given a membership perspective, and this should not be taken for granted, it has to implement the same requirements that we implemented acceding the EU. The same relates to NATO. In 2015 Lithuania joined the EUROZONE. In this one-year have there been any noticeable positive or negative effects of using the euro as the official currency? There are some stereotypes, which came from other EU countries that prices will go up and there are some discussions going on in the multimedia that prices went up, but the statistics did not prove that. The Euro is popular, more than two thirds of the population are in favor of using the Euro as an official currency. You can read in the media that joining the Eurozone was a self-protecting mechanism against the Russian threat. Psychologically yes, because since our independence in 1990 we have been very vocal and clear that we need to integrate ourselves in all possible western structures to get rid of the political ties of the former powers, especially Russia. Lithuania has a directly elected female president. How well represented are women in Lithuanian politics and what kind of example do you think Lithuania is setting for other countries? In politics we have many women in power, for example the Speaker of the Parliament and some Ministers. It used to be in the former government even the most important positions, the Minister of Finance and the Minister of Defense were also women. In the business sector also there is a good proportion between female and male leaders in higher positions. Still there remain some differences in wages, but differences are getting lower. We have the European Institution of Equal Opportunities in Lithuania, which is also a sign that this is one of the priorities in our government. Your whole career has been dedicated to international relations; what advice would you give to young people who are interested in pursuing a career in international relations or diplomacy? This is a difficult question. Young people should not be disillusioned. Politics sometimes seems to be too pragmatic, and young people should understand that value based policy is a good policy, whereas pragmatic policy can be a dangerous policy. Are you talking about populism? Populism also, but pragmatic when economic interests are taking as a priority at the expense of value interests, for example respect of international law, respect of human rights, respect of democracy and so on. In my opinion value based foreign policy has a future.